A collection of TMNT stories, both reprints from other sources as well as all new material, done as a benefit book for the Literacy Volunteers of Chicago. “Bottoming Out” – A TMNT tale by Kevin Eastman, Jim Lawson, George Hagenaur, Eric Talbot and Steve Lavigne. 4 pages. “The Treaty” – Usagi Yojimbo and Leonardo team-up by Stan Sakai. 10 pages. “Junkman” – A Donatello story by Michael Dooney. 10 pages. “New York Ninja” – Donatello solo adventure by Kevin Eastman, Peter Laird, Ryan Brown and Steve Lavigne. 10 pages. “New Comic Day” – A Michaelangelo tale by Peter Laird, Jim Lawson and Steve Lavigne. 6 pages. “Teen Techno Trio Plus One” – An alternate universe TMNT story by Don Simpson. 9 pages. “Teenage Mutant Ninja Turtles” – The Turtles retrieve a lost sword by Kevin Eastman, Peter Laird, Ryan Brown and Steve Lavigne. 5 pages. “Stompers” – All four Turtles in a gang battle by Kevin Eastman, Michael Dooney and Steve Lavigne. 12 pages. “Terror by Transmat!” – The TMNT, Fugitoid and Utroms battle the Triceratons by Kevin Eastman, Peter Laird, Ryan Brown and Steve Lavigne. 10 pages. “Ghoul’s Night Out” – Donatello’s nightmare by Eric Talbot. 8 pages. “O Deed” – Michaelangelo’s nightmare by Michael Zulli, Stephen Murphy and Eric Talbot. 6 pages. “Crazy Man” – The Turtles capture a mad bomber by Kevin Eastman, Ryan Brown and Steve Lavigne. 8 pages. “D’Ants Fever” – The TMNT visit a seedy bar filled with aliens by Kevin Eastman, Peter Laird and Steve Lavigne. 8 pages. “The Road Trip” – The TMNT to go through great pains to see a movie by Kevin Eastman, Peter Laird and Ryan Brown. 5 pages. “Don’t Judge a Book…” – The Turtles prepare for a Halloween party but are interrupted by burglars by Kevin Eastman and Peter Laird. 8 pages. “Fun with Guns” – Raph and Casey get into big trouble by Kevin Eastman and Steve Lavigne. 14 pages. “The Survival Game” – The Turtles play laser tag by Ryan Brown, Jim Lawson and Steve Lavigne. 8 pages. “Not One Word” – Donatello has a bad day by Eric Talbot. 10 pages. “Splinter in the Eye of God?” – Splinter contemplates his life by Michael Zulli and Stephen Murphy. 8 pages. “You Had to Be There” – Mike’s barbarian adventure by Kevin Eastman and Richard Corben. 4 pages. “Complete Carnage and Radical” – Casey and the TMNT help Radical fight CC by Kevin Eastman, Jim Lawson and Steve Lavigne. 6 pages. “The Howl” – Raph finds a werewolf by Eric Talbot. 4 pages. 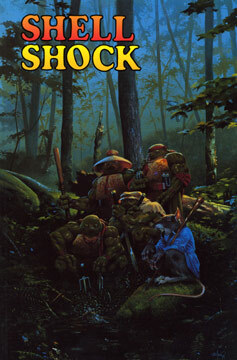 “Night Life” – The Turtles capture some cop killers by Kevin Eastman, Ryan Brown and Steve Lavigne. 6 pages. “Technofear” – Donatello gets digitized by Peter Laird and Steve Lavigne. 7 pages. “It’s a Gas” – Mike and Raph get a snoot full of nitrous oxide while trying to prevent a burgalry by Eric Talbot and Steve Lavigne. 6 pages. “Meanwhile… 1,000,000 B.C.” – Renet and the Turtles have some prehistoric fun by Michael Dooney. 2 pages.